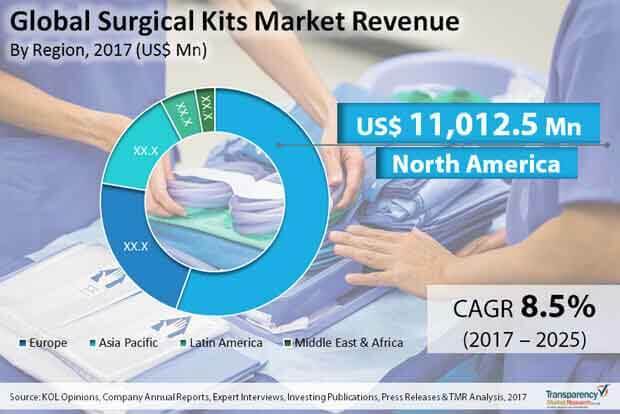 The global surgical kits market is witnessing tremendous rise, thanks to the continuous efforts by leading players to produce technologically advanced products, states a new research report by Transparency Market Research (TMR). Paul Hartmann AG, 3M Health Care, Medline Industries Inc., Mölnlycke Health Care, Medica Europe BV, and Cardinal Health are some of the leading players operating in this market. These participants are likely to focus on innovation and inclusion of newest technologies in their products over the forthcoming years. Strategic partnerships are also expected to be trending among the players, looking to expand their reach across regions, reports the market study. According to the market report, global market for surgical kits was worth US$18.25 bn in 2016. Researchers anticipate this market to expand at a CAGR of 8.50% during the period from 2017 to 2025 and reach a value of US$38.03 bn by the end of the period of the forecast. Among products, disposable surgical kits garner a higher demand and are expected to remain doing so in the near future, thanks to the increasing awareness among people about the benefits of disposable surgical kits and packs and technological advancements in these kits. Hospitals are projected to continue as the key end user of surgical kits over the next few years. Geographically, North America, Latin America, Europe, Asia Pacific, and the Middle East and Africa have surfaced as the main segments of the worldwide surgical kits market. Thanks to the rise in technological advancements and better reimbursement policies, North America has occupied the dominant position in this market. Analysts at TMR project this scenario to remain so over the forthcoming years, notes the market study. “The worldwide market for surgical kits is gaining substantially from the continuous rise in the global geriatric population, who are highly susceptible to chronic diseases and need to undergo various surgeries,” says the author of this study. Apart from this, the rise in awareness pertaining to personal hygiene, increasing spread of various infections, expanding patient pool, and the continual advancements in technologies and products are driving this market considerably across the world. Nowadays, hospital acquired Infections (HAI) and surgical site infections (SSI) have become a common cause for infections among people, worldwide. According to the findings of the European Centre for Disease Prevention and Control (ECDC), one, out of twenty patients, gets affected by HAIs in Europe. Since, several types of invasive, non-invasive, and minimally-invasive surgeries server as efficient treatment for these infections, their demand has increased, reflecting positively on the uptake of surgical kits across the world, states the report. On the other hand, the high cost incurred in surgeries and the absence of proper reimbursement structure in emerging economies may hinder the growth of the global market for surgical kits in the years to come. However, the increasing support of government initiatives and rise in investments for the advancements in medical and healthcare infrastructure will normalize the impact of these restraints over the next few years, reports the research study. Disposable surgical kits garner a higher demand. Thanks to the rise in technological advancements and better reimbursement policies, North America has occupied the dominant position.